Browse this section of the 1977 AC catalog, covering the 608. DOES A LOT MORE THAN CUT GRASS. The 608LT really cuts it -- and we don't mean lawn alone! Because when Allis-Chalmers engineers designed the 608LT, they knew that there's a lot more to lawn and yard care than just mowing the grass. So they engineered a tractor- that puts power to work for you to clear snow...to haul loads big and small...to bulldoze dirt or gravel. In short, to tackle jobs that are too big for most other-lawn tractors--and handle them with surprising economy. Our- 608LT does it all with an 8 hp Briggs & Stratton synchro-balanced engine built for smooth, dependable service. With a transmission that's tough and reliable ...no matter what the job. And with the kind of extra strong frame design you'd expect to find only on more expensive machines. It's all there--plus a ride that's as comfortable and stable as we could make it. That's the 608LT from Allis-Chalmers. Year 'round versatility for season after season savings. 36" Rotary Mower. The two spindle design of our 36" mower means fewer moving parts, less maintenance. Engineered for non-scalp mowing, with flee floating mower attached to pivoting front axle. 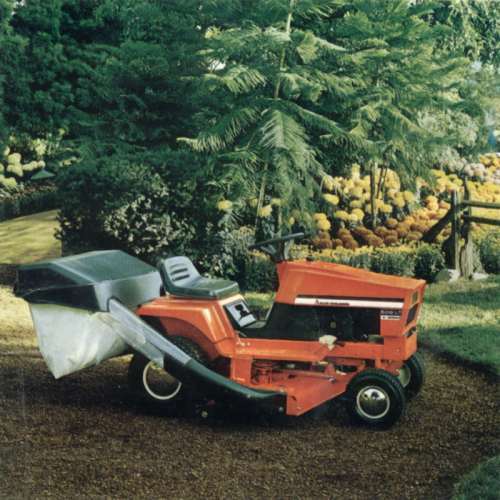 Mower operates with less power because grass is discharged faster without recycling. Big optional 5 bushel capacity grass catcher slides out for easy handling.